When you think of the romance of Italy, Venice in Veneto is often what comes to mind. From the famous canals and gondola rides, to the alluring architecture, art, and surrounding towns and city, Venice offers visitors a slice of Italy’s deep history and charming romance. What better way to experience the city and the Veneto region than by venice motorhome rental and campervan hire in Italy? The nearest Venice Airport, and the most commonly used when traveling in from overseas, is Marco Polo Airport. Marco Polo lies approximately 30 minutes outside the city, and this makes it ideal for picking up your Venice motorhome rental. There are a couple different Venice campsites you can choose from, one being Camping Fusina, located only a short 20 minute ferry ride into Venice. Camping Fusina is also located on the water, and some of the Venice camping spots look directly over the water. This gives you an excellent view of the boats sailing into Venice, as well as a glimpse of the city in the distance; the perfect city meets country experience! It also gives you a unique and quiet perspective on the city, steering you clear of the nearly 60,000 tourists that head to Venice every day. Depart from your Venice motorhome rental campsite for a trip into the city to view some of the most sought after sights, or even take a tour of the lesser known reaches of Venice. Whatever your agenda, don’t miss St. Mark’s Basilica, a gondola ride through the Grand Canal, the Piazza San Marco, and the expression of Venice’s status as a powerful city-state of long ago, the Doge’s Palace. Even the most anti-touristic people enjoy these sights; after all, Venice in its entirety is a UNESCO World Heritage Site. Take advantage and take in the architecture and history that put Venice on the elite destinations map. Once you’ve gotten your share of Venice sightseeing, take your campervan rental in Venice airport out to visit Padua and Verona. Padua is less than an hour east of Venice and contains the oldest botanical garden in Europe, as well as the amazing Basilica di Sant’Antonio. If you still have time to kill, check out the Scrovegni Chapel Frescoes. Back in Venice you may have admired the large biblical themed paintings in the chapels of San Sebastian and Our Lady of Rosary. Verona is an hour east of Padua, and home to one of the “great trio” that characterized Venetian painting in late Renaissance, Paolo Caliari, who also went by the name Paolo Veronese. If you’re a literature fan, or a Shakespeare fan in particular, you’ll find the balcony that is said to be Juliet’s from Shakespeare’s popular tragic romance Romeo and Juliet here in Verona. Feel free to do a little exploring as you make your way to Treviso by Venice motorhome rental or campervan hire. Treviso is located to the north of Venice and is known as a medieval town littered with interesting little canals and alleys. The ride to Treviso takes about 20 to 30 minutes, so it’s a short drive, but you can take the time to see the countryside and explore a bit more of Veneto, particularly Treviso’s vineyards which make the local wine ‘prosecco’ you may have enjoyed back in Venice. 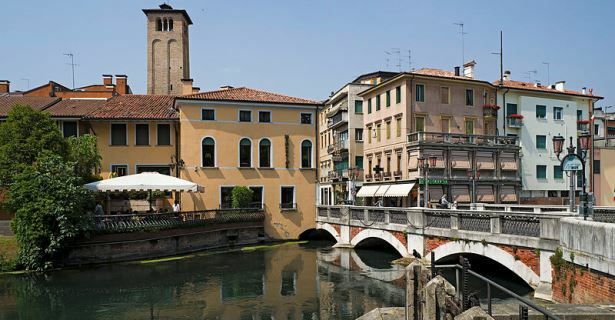 Once there, explore the city’s medieval remnants, from the walls built for the town’s defense to the moat that still stands as a reminder of Treviso’s history. While Venice is a great travel all its own, the Veneto province in its entirety has a lot to offer travelers with the resources to tap into them. A recreational vehicle or RV Rental in Venice Airport will allow you the access to the entire Veneto province whose many ancient and historic sights make it well-worth the time to drive it and take it all in.